The federal government has said its decision to deregulate the downstream sector of the petroleum sector would improve on its school feeding programme. 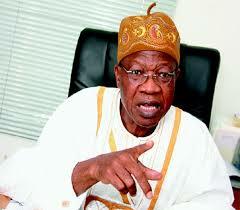 Minister of Information, Lai Mohammed, stated this yesterday, when a federal government delegation, led by the Secretary to the Government of the Federation, David Babachir Lawal, met with members of the National Working Committee and State Executive Committees of All Progressives Congress, APC, in Abuja. According to dailypost.ng, Lai Mohammed said, “The first is the employment of 500,000 unemployed graduates, the second is the employment of 100,000 non graduates, technicians and artisans. The third is the one meal a day programme targeting 5.5 million pupils all over Nigeria. This is the most exciting of all our programmes. “Even if we are going to give these children one egg a day, it means we will need 5.5 million eggs and in a calendar year of 200 days, we will need over a billion eggs. You can imagine what this will do to agriculture. “We have the enterprise scheme which is a system of revolving loan. We are targeting one million market women and men, 460,000 artisans and technicians and 200,000 agricultural workers to be given loans through their cooperatives to start their own businesses. We have the N5,000 conditional cash transfers to one million most vulnerable Nigerians as a first phase. National Chairman of the party, Chief John Odigie-Oyegun, said such meetings would be convened on a regular basis so party members would understand government’s policy. He said: “What this does is to arm everyone of us from the national and state levels so that we can speak with confidence, in addition to whatever passion we can muster about what is going on at the national level and go away with the conviction that things are not just happening capriciously with the conviction that we promised change.